Andrey Skorokhod, M.Video, Contrapunto agency and Artworks production congratulate all women with International Women's Day! In the spring, not only rooks arrive, but also discounts do the same. And anyone can easily get under the spread. You just had to open the refrigerator, or sit down on the washing machine, or to turn on the sound of the speakers for full, as discount cards themselves started to rain everywhere. We had to use stop motion to fix everything exactly. Under the cheerful rap all this action was perfectly fixed by director Ilya Solovyov and cameraman Ivan Lebedev. Very "sweet"and at the same time useful comercial "Essentiale Forte N" was shot in the sometimes warm and always hospitable Belgrade, where some brothers-Slavs gathered into a friendly company. Leo Burnett Agency came up with the cautionary story how all we can restore our liver after the "abundant" holidays. This lesson was quickly taken by whole team of Artworks Film. It needs to note that not all the cakes were fake, for which special thanks to Vladimir Janic & Sanela Spajic! Now we want to tell about delicious story of the coffee machine "Philips LatteGo", the implementation of which has become possible, thanks to the Agency POSSIBLE, Director Artemy Ortus, DOP Anatoly Trofimov, production designer Alexander Aulov and the whole production team. If you watch the video and purchase Philips LatteGo, then instead of a coffee shop, you can easily invite your friends not that far , to your own house. Just do not be surprised if one of them says: "I ordered it with cinnamon." How to become a monopolist? The answer to the question is simple: Back in 2017, during the shooting of videos of “Monopoly” Artworks Film tore the same sticker, under which there was a prize-the right to shoot movies McDonald's next year (of course it's a joke). And - voila! Three days of shooting were going at rapid pace - a few hours of shaking in the subway, a lot of skydiving, a couple of disassembled cars, the first snow and Russian frost. Everyone liked the process so much that on the final day our friendly team broke up only in the morning, keeping the memory with advice how to improve living conditions and solve transport problems. To build a scenery in extremely short time and clone a person quickiest possible? We can do even more than you think One more photo project with the Instinct Agency for the Artworks Film portfolio. Exellent work of photographer Alexei Konstantinov and as result poster advertising tariff "Manage it" of MegaFon. TVC of the cookies "Lyubyatovo" (brand Kellogg's) by Leo Burnett I saturated with kindness and warmth. The key to the such mood was, of course, very coordinated work of the whole team. Leo Burnett, led by creative Director Natalia Rumyantseva, came up with very interesting and dynamic story, production designer Alexander Aulov built cozy and ‘homy’ interior in the country house, DOP Mikhail Krichman caught all the nuances of acting, and the Belgian Director Guy Goossens, with whom Artworks Film was happy to shoot this commercial, perfectly got along with everyone: with children, grandmothers, adults and even with animals. And Andrey Makarov, in turn, had no language barrier with cookies, chocolate and blueberries. A real team of masters! In the summer whirlwind of Artworks shooting TVC projects crept chamber and appetizing atmosphere of photo shoot of the oven for famous European brand Hansa. According to the idea of the Graphit Agency in the interior kitchen studio"appeared" podium in the form of a long baking pan, stretching directly from the oven. Under the rhythmic clicking of the photographer Aleksey Gorbunkov’s camera on non-combustible surface were sliding delicious meals cooked by the food stylist Diana Nagornaya. This video makes you nostalgic about very recent times, and admire the technological leap of the last 25 years. Agency Instinct, as always, unmistakably found the most sensitive "button" of any person: Who does not remember their first? What can not be said about the search for props, it was not easy to find a brand new phone NOKIA 3310 or new old smart fridge in the package. Therefore, Artworks Film had to reveal his old secret and demonstrate our own time machine. And all this travel in time was meticulously fixed by Director Sergey Minadze and DOP Alexander Polishchuk. The song "Rose wine" has become a real musical event in 2017, famous for the rapid streaming in social networks and number 1 in the iTunes and Apple Music charts. Since then all progressive hip-hop-house-rap community with the fading fibers expected moment, when the Eldzhey and Feduk will emerge in advertising. And it happened! Two super-giants- retail and mobile-M. Video and Huawei could not resist of using the popular track. And look who helped them in this: Agency TutkovBudkov, director Alexander Soloviev and production house Artworks Film. Dear friends, We wish you a Merry Christmas & a Happy New Year! Three white horses - Agency, production, client! We present a new year's video for M. Video, which without any doubt can create a festive mood! After the end of this project, the entire team of Artworks Film sang the famous song of Evgeny Krylatov and Leonid Derbenev. Twiga Touch Agency has prepared a great script for the New Year commercial for the M. Video network , which Director Konstantin Charmadov beautifully materialized into good and familiar atmosphere of the new year bustle. Like in a kaleidoscope locations follow each other leading to the final great dance miniature while the whole enchanting story is orchestrated by New Year hit from the movie "Charodei". TV commercial Series "McDonald's Monopoly" created by Leo Burnett Moscow, caused a lot of reasonable questions among specialists in TV advertising. Who would have developed such a super set design instead of Denis Leshchenko? Who could so masterly arrange each frame if it was not Maxim Zhukov? Who, also masterfully, was able to orchestrate each tiny scene instead of Tigran Bezhanov? And finally, the question which is absolutely rhetorical: What production could provide such a brilliant result if not…Artworks Film? The new TMALL byAliExpress TVC was made by a seasoned director Yaroslav Chevazhevskiy and DOP Mihail Hasaya. “Star Reachers” agency creatives gave a kings crown to the actor Andrey Chadov, which confused all of the european princesses of marriageable age. A sudden spring of oil on a set built dacha threatened to bring down oil prices on the market. And the amazing flight of the boxer was noticed by some of the art historians. Some say that there were references to Dali’s "Dream Caused by the Flight of a Bee Around a Pomegranate a Second Before Awakening". In regards to the Confederation Cup, our production company is also in football mood, all the way to the Cup Final on July the 2nd. Amid the football fever Artworks Film produced a TVC for M.Video, electronics and appliances retail network. One of the main protagonists is undoubtedly football freestyler Mikhail. What skills did he show with the football! In moments like these south american commentators would scream on top of their lungs “El fantastico!”, but our football commentators, with nordic calmness in their voice would just say “Krasava”. Exciting juggling and tricks were captured by director Yaroslav Chevazhevskiy and DOP Evgeniy Ermolenko. By the way, the TVC was made in support of the M.video action in which the customers receive the official Confederation Cup ball “Krasava” with certain purchases. With the creative idea of Instinct creative agency for M.video, Artworks Film joined in on the drone racing event set for June 17th. M.video customers can pick a winner drone and win a prize if they guess right. Racing teams will be headed by a few public figures: actress Yuliya Topolnitskaya, travel blogger Dmitry Maslennikov, actor Mikhail Bashkatov and the figure skating Olympic champion Adeline Sotnikova. The film was made by director Yaroslav Chevazhevskiy and director of photography Evgeniy Ermolenko. New commercial for the McDonalds called "Meat Classic", which advertises a new line of classic McDo burgers - Grand Cheeseburger and Cheeseburger Deluxe, was produced by the young and talented director Jaroslav Peger in partnership with the wise and ingenious DOP Bek Hamraev. The shooting shift turned out to be very long, but cheerful: first in one of the McDo restaurants, then moving to the Cultural Center of Ukraine, then moving to the apartment's set. Unfortunately, the scenes in the museum with the fillet part of the statue of David were cut out, but everybody certainly remembered the genius violinist. A foreign actor who was invited from neighboring Ukraine, certainly the director and the client liked him too much. In April 2016 Artworks Film's team has got a task from the ''Cherkizovo'' group: to shoot sunny commercial for the brand ''Petelinka''. It was far from summer in Moscow, but sun, green grass, blue skies and other summery things were required. We managed to find a piece of summer in the renowned city of Belgrade, where our production team found a very hospitable atmosphere at the production house Media Plus. All the kilograms of ''Petelinka'' fresh chicken got on the journey together with the Director Vasiliy Chigynskiy and DOP Sasha Polishiyk. Scenic sights of the city, brilliant Serbian cuisine along with a hearty welcome cheered up the Russian team. Two spots were shot just in two days, one of them is already on air now; next will go this autumn. At the fairytale end, Russian-Serbian collaboration ended up to be a productive and a ''meaty'' one. The production of the new Megafon commercial ''Half a house for corrida'' was also divided in two. Not only were there two production houses involved – Artworks Film and Action Film, but also the shooting locations were in both Russia and Spain. Luckily for us, the Spanish part was organized by Artworks Film. So, Megafon corrida took place in Malaga, a legendary Spanish town well known for, among other things, bullfights and for its hot climate. Director Alexander Kott and DOP Levan Kapanadze had to work to their limits, as did Producer Nathalya Azovskaya, who happened to have her birthday at that time. The process has been complex by sheer number of scenes to be shot – eleven, all in different parts of town. There has been no special traffic close offs, production team had to be on the run fast after each scene was done, no time to stop and take a break. They had to slide along curious tourists and lazy locals in the rythm of the salsa. Finally, the lead actress had to fly to Tel-Aviv later that day, so Artworks production team ran like a top, and she had a little more than an hour to get on the plane. Moreover, here's a hack, the arena for corrida had been shot in another town, nevertheless the bullfighter was the real one, not a fake one from some picture stock. All in all, production team has rubbed not only Spanish streets, but also blistered Russian heels. New commercials for the sausage brand ''Vyazanka'' by creative agency Leo Burnett Moscow and ABI Product collided atmosphere of fantasy worlds and home amenity. In first spot ''The Elf'' made in the fantasy genre, P.D. Denis Kladienko together with Director Yaroslav Chevazhevskiy created a unique stage set: long corridor, mysterious curtains, rock walls, covered with ivy and a big dinner table gathering all family together for the meal. And for spot ''The Princess'' the set had been magically transformed into a space full of sorcery and mystery. The lair of a good witch with copper pots and scenting herbs finally opened its gates to a cosy home of a loving family. DOP Mikhail Hasaya used anamorphic lenses which let him create a dramatic cinematographic effect where shots were both deep and had smart lights setup. Ruthless creatives from the 2Sharp agency put the frontman in a perilous situation in the new Mvideo ad. This time around, Aleksandr Pushnoy was in the thick of things. The cosmic battle for the HP limited edition notebook was set right in one of the Mvideo stores. By efforts of director Dmitry Venikov and director of photography Denis Firstov, the protagonist endured the intergalactic trial course almost unscathed. And the set up of the battlefield was created by art director Andrey Gaponov, and studio Trehmer is responsible for the visual effects. And, traditionally, no gadgets were harmed during the shooting of this ad. Russian singer - Natalya Podolskaya, presented the project. She became brands ambassador. As is often the case, even the spot looks easy – the shooting wasn’t the same. At first we need to say that Pampers policy is really careful about all mother & baby relationships moments and about shooting. All the crews have to study big book called “Pampers with safety guides” and remember all the details. All other shooting except the main one was prohibited. There were an emergency, keeps watching for babies till the shooting day ends. And all the production crew were taking care of the babies also. So everyone respected Pampers safety guides. Artworks Film wishes you a Merry Christmas and a Happy New Year! New commercial “This is the best way” created by Instinct agency about beneficial Megafon roaming continued proud tradition of short-length stories with participation of Russian cinema and theater stars. Old Italian proverb occurs after watching this commercial - «abito non fa il monaco». Which means in Russian free translation: “Commercial does not make a person, but person does”, if consider more precisely – people. This time main role was performed by incomparable Irina Pegova, and secondary roles were played by actors from Italy and Spain. The atmosphere of cool wedding salon “somewhere on Appenine peninsula” was created by director Nigina Saifullaeva and dop Mark Ziselson. What about costumes – editor of superfashionable magazine L’Officiel was invited as costume designer. According to gathered company all costumes are obliged to be premium: Vera Wang wedding dresses, Gucci and Manolo Blanik shoes. In fact, it turned to luxury story in all senses. In september 2015 Artworks film faced an unusual challange by the Ogilvy & Mather Russia agency – to tell the story about the hugest mall «AVIAPARK». By using POV of its residents – fishes, which are living in the 23 meters hight super-aquarium. It is the main embellishment in the mall, which area equals 390 thousands square meters. Such a big task made Artwoks film crew feel really exciting! Even on recce all crew members with director Vitaly Shepelev and DOP Evgeny Ermolenko walked about 14 kilometers. And it’s scary to imagine how long was the common mileage! Well, it’s also hard to count the common weight of all of film equipment, which was carried from one floor to another. The shooting was done with two cranes - it allowed to make an elevator-moving camera effect. And all this job was done to make two pretty animated fishes, made by Thehmer post-house, feel fun while discussing “shopping sharks” weekdays. In the new video from MegaFon and Instinct agency famous actor Sergei Gazarov played a major role. Sergei masterfully played the chef, who controlled the work of the kitchen with working tablet. Chef has time for everything on the kitchen: to make observations to unders, leave the last bar on the specialties. And with a quick Internet from Megafon helps his daughter to cook a little culinary masterpiece. Directed of commercial "Chef" Dmitry Dyachenko turned into quite familiar surroundings, as he filmed three seasons of "Kitchen" and the full-length version of "Cuisine in Paris", and the dop was Igor Grinyakin. According to the producers of video, shooting shift was not easy: cookers was cutting in the frame, was burning, but still continued to work. And the result is a fascinating picture and interesting family history. For the shooting of the TVC for "Strepsils Intensive", Artworks Film experts have built a modern research laboratory replica, and the most notable of its decoration has become a huge model of the human oral cavity. With the submission of creative agency Havas Worldwide, the layout of the mouth came to move and glow by commands of the “wise professor", who in his turn did not allow the main character to feel like a grandmother because of ordinary discomfort in the throat. Weekdays of laboratory "Strepsils" captured for posterity by the director Eric Sharifullin and dop Ulugbek Khamraev. Heartfelt story "Roll" of MegaFon and Instinct agency was shot in two locations - in a hypermarket of building materials and in the parking. A lift between them - especially built decoration. Actor Alexander Robak not only brilliantly played the role of the imperturbable and thriftyhenpecked, but well played up the paint. Six takes had director Dmitry Dyachenko and operator Perth Dukhovskoy to reveal in all its glory conflict between banks with green paint and a paint roller. And how suit of Alexander Robak wouldn't have been dirty – will remain in a little secret of producers and costumers from Artworks Film. Even more so if it's an anti dandruff shampoo. That is what Saatchi&Saatchi decided by inviting the international sport star Daniyar Eleusinov to feature in the new Head&Shoulders TV commercial. And the Artworks Film team went to Kazakhstan, the famous boxers home land. If you think that jump ropes are for girls, that playing ball is for boys, to listen to advice from your elder is not cool, and to take care of your looks is not manly, you better leave your prejudice to yourself. Otherwise you might have an unpleasant conversation with 2013 amateur boxing world champion, and twice the champion of Asian Games in 2010 and 2014. You cannot dispute those proofs of manliness. The message from Daniyar was put in to a TV commercial by director Gleb Sereda and dop Dmitriy Bryuglass. By the beginning of the school year "M.Video" with the help of the creative team of Instinct (BBDO Russia Group) has arranged the pre school year sale. The choice of the head of the virtual research institution was not a problem. The Novosibirsk's Academcity native, and a popular showman Alexander Pushnoi is perfect for the part. Head of "Research Institute R.A.Z.U.M" Alexander Pushnoi has long been known to children and adults as a host of scientific-informative TV show "Galileo". The commercials were directed by Yaroslav Chevazhevsky and dop Evgeniy Ermolenko. New testimonial commercials with Havas Worldwide for Nurofen was done in two options – for Polish and Russian markets. The commercials feature real moms with their kids, and if you turn off the sound the video shows how beautiful moms and kids are in every country. The priceless experience with fighting cold and high temperature was documented by director Aleksandr Soloviev and dop Yasya Skrinnikova. Hosts of cognitive telecast for travelers "Heads and Tails" Andrey Bedniakov and Nastya Korotkaya told us about new possibilities of Ford Fiesta. Commercial by the agency Ogilvy & Mather Russia turned into fun and games. In the confined space of a vehicle interior Andrey and Nastya played with the new modern "bells and whistles" of one of the best known car brands - Ford. Director Vitaly Shepelev not even required to toss a coin to choose: which of the pair would be acting at the wheel. They both performed well. And the couple did not have to be distracted by the road, during the filming the car was on a platform. P.S. Reminder: all situations inside the car and movements of heroes are fictional! Do not repeat this in real life! CSKA stadium is under construction on the 3rd Peschanaya Street, and not only received a certificate of membership in ESSMA (European Association for the management of stadiums and security), but also became a place of shooting of a video for a global leader in the production of football products - Adidas. According to the authors of the commercial - agency Louder, in the futuristic surroundings of the stadium construction in Moscow, there was a gang of bold young players. So in our case, careless handling of the ball led to an appearance on the set of the stars in the face of Igor Akinfeev, Bibras Natcho and Pontus Wernbloom. Directed by Alexandr Starostin and dop Vladimir Ushakov obviously know a lot about the most popular game on the planet. Short match of football stars Pontus, Bibras and Igor with bold juniors was very impressive and spectacular, and it ended with a draw score and a friendly exchange of shirts. In 15 years in the business, we did not have a talent as young as this one. Little Alexey is barely 4 months old, and he already starred in a commercial. Looks like Havas Worldwide will soon open up a museum of unique mechanics for TV ads for the most different of products. This time, the effect of a well known stain removal, Vanish Oxi Action, was dissected on a specially built table-thermometer. A couple of easy moves and the pink spoon contains a hot thing. The rest was the matter of technique of Artworks Film specialists in building mechanisms and a bit of magic from Vanish. The inspiration to the lovely housewives was provided by director Vasily Chiginskiy and dop Petr Braterskiy. How to paralyze a big office building? No need to push the fire alarm button and certainly not call the police. LeoBurnett has found a secret and reliable weapon – all you need is a bus full of preschool kids park nearby and show them the way to the reception. The results will surpass the expetations. Children will find their busy parents in no time and evacuate them to the world of family values. «Attention! A vacuum cleaner ran from home! Name – Philips, first name – SmartPro, a.k.a. – Compact. Features: height 6cm, intelect – 18 sensors, color – black». Possibly news like this will not surprise anyone soon. But for now, Artworks Film together with Ogilvy&Mather had to run around the city chasing the renegade. By the way, the whole project took less than a week from start to finish. For a while, the director Ivan Oganesov had to submerge in the world of a robot vacuum cleaner, and dop Aleksandr Polischuk had to lower his eye level to one much closer to the ground. The happy ending was in doubt, as the renegade found out that while away he has been replaced with an advanced model «Active», but who would deny having two little helpers instead of one. Happy end after all. PureVision 2 contacts from Bausch&Lomb would be good enough for a starship crew, but they are also very good for any driver with impaired viion. Especially if they're navigating the rainy Moscow streets. It is hard not to agree with Aurora Creative agency on that. From the spaces of a far CGI galaxy the crew, led by director Ivan Oganesov and dop Aleksandr Polischuk managed to land a few blocks from the Artworks Film office – on New Arbat street. That is where the non CG part of the commercial was shot. The short episode on the planet Earth was a success. The Artworks Film team withes you a good vision, quick reaction and best of luck on the roads! Traditional «gender holidays» with Eldorado franchise continues to pleasently surprise us, and a specific couple with unexpected gifts in the new TVC from McCann Moscow. Director Vitaly Shepelev, together with dop Vlad Opelyanc in an average kitchen managed to maek a mini sitcom about love and gifts, which you can most certainly a good thing to get used to. Film and TV star Dmitry Dyuzhev convinced himself to buy a new Megafon product in Megafon Login+ commercial. The gadget and Dyuzhev dissolved in each other by turns: the gadget disappeared in Dmitry’s pocket, then the actor appeared on the screen of the gadget acting like a strict tempter. However, the authors of this story suggested to put a charming consultant behind him for the greater confidence. What man will resist such a suggestion? The filming took place in one of the Megafon’s shops in Moscow. Director - Gleb Orlov, DOP - Marat Adelshin. The creative idea of TV spots for "Systane Ultra» eye drops belongs to Publicis United agency. They were directed by Yaroslav Chevazhevskiy, cinematography was done by Antoine Vivas-Denisov. The close-up shot with a weird employee who is doing a useful eye exercise was shot in a real office. The girl who exchanged comedy and pop-corn for an ice basket was shot in a real cinema. The scene with a granny who almost missed the birth of the second Picasso because of tea bags on her eyes was shot in the built set. We could only include three stories in this spot, where people get into difficulties because of eye discomfort and have to fight with it with expedients. We can only guess, how often such situation occur in our everyday life. One thing remains certain: Systane Ultra to the rescue! Under the guidance of crative group of BBDO Moscow, Gosha Kutsenko had to get into a giant pop up book. For a new TVC for electronics and appliances retailer “Eldorado”, ArtWorks Film team had to thoroughly look into the, now are, polygraphic genre - creation of a pop up book. The size of the book is somewhat impressive, as we had to make the actor whose height is 185cm look in place inside the book. The adventures of Gosha in the Wonderland were directed by Ivan Oganesov, while the director of photography was Aleksandr Polischuk. Ekaterina Vilkova displayed endless patience on the shoot of the spot for Novo-Passit herbal sedative, show tithe Ogilvy & Mather. The actress had to change 5 dresses and go through 20 takes with spoiling water. But Vilkova did well, went strong and had fun. The director of this spot Martin «Martines» Schmidt proved himself as a real member of the homeland of the founder of experimental psychology Erich Fromm. Martin tested all the the sedation of every couch and the steadiness of every glass himself three days before the shoot. All the actresses during the casting and even our casting director were all wetted with water! In the new «Megafon» spot shot by Artworks Film and Leo Burnett Moscow everything was actually Included: the inimitable Ivan Urgant, unique set and easily amused Ludmila. The set where this spot was shot is also worth noticing. The story takes place in a hypermarket, but it was shot in a studio. Artworks Film’s team made a huge effort to build half of the hypermarket in 7 days, including checkout lane and shelf stands 4 human scales high and filled with real products. How can we not mention Ivan Urgant…When Ivan is in the shot, the lights thicken in the hall, and everyone immediately understands that «Wholesale is cheaper». It has been almost a year since Alena Lvova left us… We still feel her presence with us. We remember and cherish all the times and emotions Alena gave us. On September 18th at 11:00 on Danilovskoe cemetery, at 30 Dukhovskiy pereulok we will hold the memorial service for our Alena. A kingdom for a tablet! How many takes did the director Yaroslav Chevazhevskiy and DOP Levan Kapanadze “squeeze” out of the boy who played the part in the new TVC for “Megafon Login 3”, will remain hidden, along with the fact if he ever got the tablet from his parents. Something else is obvious though, the young man is showing the beginnings of a true politician, he was giving promises left and right without difficulties. For you to be able to see for yourself, we decided to put all promises in one making of film. The problem of romantic relationship reaching the apogee, “Reckitt Benckiser” and Havas Worldwide Moscow have no trouble solving. Of course, if you present a small red velvet box to your beloved. And, truly, a sapphiry “Finish” tablet wrapped in scarlet velvet with a ruby like center looks like a jewel. As a long term guarantee for family happiness. This sort of melodrama was brought to life by director&DOP Andrey Lukashevich. “Eldorado” network is happily and creatively continuing to exploit the brutal image of Yuriy Georgevich Kutsenko. Now Gosha showed up as wizard-drummer. Interesting, does this drum of luck have a special lever to get you the maximum prize? The DOP on this TVC was Pavel Kapinos and it was directed by Gleb Orlov. Calgon makes us smile again. First with that they decided not to show us the awful limescale on the insides of a washer. This time “Reckitt Benckiser” along with Havas Worldwide Moscow decided to seek for inspiration in nature. For this we developed and modeled a 3D frog. It turns out that the inhabitant of swamps is in a washer drum waiting not for a prince, but for new Calgon gel. The director of this TVC was Konstantin Charmadov, DOP Anastasiy Mikhailov. Havas Worldwide Moscow came up with the creative ide which was made into a TVC for "Lemsip" which fights cold and flu. The story of the TVC as well as the music bring nostalgic feel of old Soviet Scientific Research Institute. In reality it is a modern office, where passion boils no less than in SRI. More than anything boils the new solution for flu. «All included» film for new mobile plan was shot the way good films are shot. The talent was searched for in three countries simultaniously. The reason for such serious approach was that participants were trying to make the film as realistically as possible – we were looking for an talented young actress who would need to be a talented cello player. In addition, she would have to play the part that was previously recorded in order to have the full synch of music and the one who is playing it. One of the locations was a Moscow airport, some of the viewer are able to tell wich. Getting a permit to shoot in Moscow airports is not an easy task, moreover, some of the shots were made in customs area. Also, in the studio was built an unique, elaborate stage for a small orchestra. All that was left was for a excellent work of director Natalia Bogomolova, DP Mikhail Khasay, teams of LeoBurnett and Artworks Film. And, of course, a wonderful melody from the composer Dmitry Shumilov. Havas Worldwide Moscow together with Artworks Film made a new series of films for Calgon, directed by Konstantin Charmadov and DOP Anastasiy Mikhailov. Two of the films were shot as a TV show. As always, real specialist took part, this time in areas of chemistry and hydrology. The wievers not only quckly learned about stalactites, but were also shown areas on the map whith hard tap water. No stalactites were harmed in the process of making this film. You can make sure by taking a look at the behind the scenes video. A series of spots for Arbidol medical product was shot with a creative-idea from Ogilvy & Mather. The films educated in treating flu and cold with the help of confirmed remedies – garlic, honey, raspberry and lemon. Naturally, if everyone took Arbidol their health would be as strong as one of cosmonauts. Artworks Film – winner of «National tax award»! In the year of its tenth anniversary Artworks Film company has received the title «Good faith taxpayer» and became the winner of exclusive All-Russian business award «National tax award». 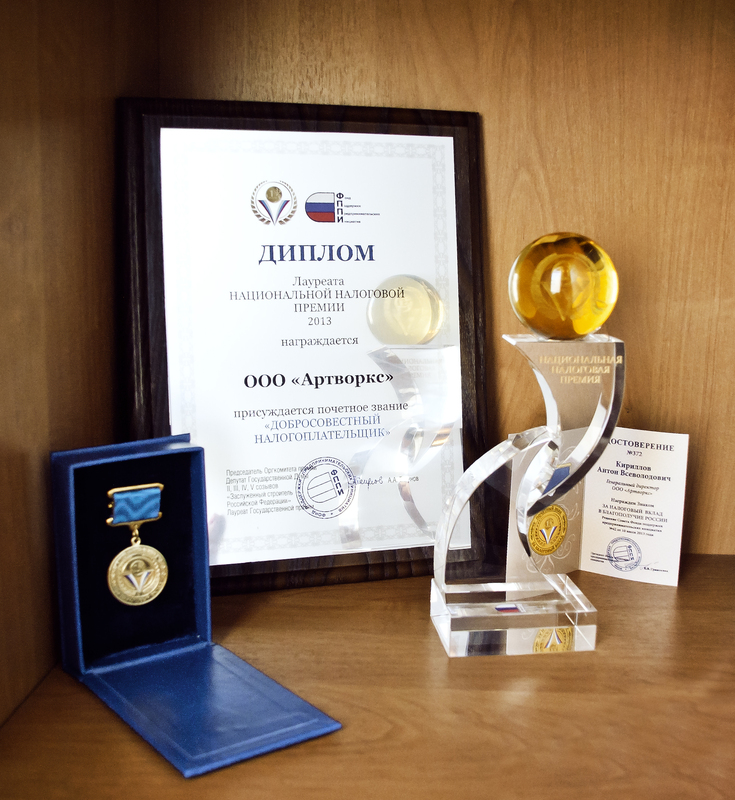 On July 11 2013 in hotel complex of Administrative Department of the President of RF «President-hotel» took place the medal ceremony of winners of All-Russian reward in the area of fiscal policy and fiscal relations «National tax prize» with awarding the title «Good faith taxpayer» to the companies and handing the Plaque «For tax investment in welfare of Russia» to business managers. Ceremony of honoring the best taxpayers of the Russian Federation proceeded in a businesslike, but very friendly atmosphere. Prizes to the winners were handed out by the Heads of federal Ministries and Agencies, deputies of State Duma, authoritative representatives of public associations and mass media. After winning this exclusive award, Artworks Film became one of well-known and serious companies of the country, and honorable prizes (in the photo) took their places in our office. New testimonial videos about using the "Calgon 2 in 1", Havas Worldwide Moscow and Artworks Film shot together with old and new friends. With director/dop Ilya Ovsenev we have worked with for nearly ten years, and after a long break everyone was pleased to work together again. New acquaintances (as required by the testimonial format) were non-professional actresses who really are housewives in real life.. However, non-professionals have shown us that they have understanding of acting performance. For example, one of them preferred to be barefoot in the wet bathroom to feel the frustration pf a broken washer, although the director did not insist on this. After the number of trials that befell the "correspondents" Roman Yunusov and Alexei Likhnitsky in the films for "Rostelecom", a new survey for the "Stop Price" plan, took place in body resting mode, but with tension of the vocal cords. New script by agency TNC.BRANDS.ADS, shows how the new plan has forced men talking on the phone just like the better half. Roman and Alex skillfully had manly subjects of conversation but in a completely different, female way. Actor Gosha Kutsenko was plunged into virtual reality in the new commercial for “Eldorado” online-store. Some naive viewers maybe even rushed to their computers to the online store to see the star running around the website and read out their search requests, but to avail... In fact, Gosha was filmed in a green studio and the rest was created by computer graphics. Commercial for Philips Juicers literally squeezed the whole crew: 42 hour shoot, two sets, 180 kW of light on one table, we got 25 liters of juice till we had the perfect shots. Artworks Film and Ogilvy produced a rather appealing film for Philips. A selected group of people from across Europe - directed by Richard De Aragues with director of photography Paul Simon, starred by Stella van der Berg, engineer at Philips. The results are two super 15 and 25 second films. The "spin" of these juicy clips can be seen in the short making of film. Still active Comedy Club performer Roman Yunusov and Alexey Likhnitsky starred in a series of commercials for "Rostelecom", presenting a wide range of services and plans for the telecommunications company. Comedians managed to talk about serious products in their usual style. Roman and Alexey, of course, had the attention from all the crew for their sense of humor, but at the same time they had to go through a lot of tests - from the real fall stunt, to a tiresome journey on the train. In fact, the train cart, which looks at least as good (if not better) than the interior of comfortable Russian Railways trains, was built in studio. Promotional video for Hyundai i40 was shot outdoors with Lowe Adventa. And hundreds of horsepower under the hood of a car on the set were accompanied by at least another seven. These were the players of CSKA football club. Sergei Ignashevich, Alan Dzagoev, Elver Rahimic, George Shennikov, Seydou Doumbia, Tomas Necid, Sergey Chepchugov acted as office workers who have picked a football battle right at the entrance of the office building. In the end this hooliganism was stopped by a rather harsh guard. During the shoot CSKA players had time not only to show their trademark moves, but also sign autographs. For the filming of "Gaviscon" commercial with Havas in a short time we made a full stomach suit. So on the day of filming the most "steamed" man on the set was the actor Alexander Morozov, who played the part of this important internal organ. As conceived by the creators, the stomach and his owner got an appointment with a family psychologist. Naturally, such an unusual couple had enough of complaints towards each other. On the spot comedy improvisation amused the entire crew. In real life "scandals" like these certainly would have ended in a divorce. Fortunately, the plot ended in peace and harmony. The new "Eldorado" film promoting the new recycling of old equipment, gave Gosha Kutsenko a multiple personalities disorder. According to the script by BBDO, he is convincing himself to give up on his old computer for a new one, sort of “to be, or not to be” decision. As usual, the shooting took place under cover of the night in one of the retail stores. Not only Gosha Kutsenko managed to stay focused despite the lack of sleep, the same feat was accomplished by the director Gleb Orlov, director of photography Vladislav Opelyants and the whole crew altogether. In the new commercials for "Eldorado" retail network, the inimitable Gosha Kutsenko answered to a question that crazed men for the past 50,000 years or more (views of historians differ). So what do women want? We hope that the tips of a knowledgeable person helped save many Russian men from the headaches and hassle at the day of March 7. Film about the new Calgon “2 in 1” supplement for washing machines that we shot with Havas Worldwide Moscow was just soaked in wisdom. Firstly, the script shows how a wise mother shows her inexperienced daughter who does not take care of her appliances to the true path and secondly, for the full transparency of the promoted product – it was co-starred by a real chemistry professor. And what should be noted, his words just reach every housewife, even to those without thorough chemistry knowledge. For the shots of the working internal mechanism of the washer we built a transparent pool which gave the professor a much needed prop to visually demonstrate the product. Many of us have not had time to buy gifts for loved ones and meat for Olivier salad, but the Knopkin family has already celebrated the New Year of 2013! Well, it’s all to look towards for the rest of us, so now we offer you a glimpse of behind the scenes action and evaluate the performance of our large team and, of course, radiant smile of Andro Okromchedlishvili. Taking this chance, we would like to once again congratulate our colleagues and friends from the crew, Leo Burnett, TNC. BRANDS.ADS Rostelecom and wish all of them a Happy New Year! A commercial from Euro RSCG for Tiret brand stuck in a memory with a procedure that has a negative scene in actual Russia. In order to get a frame of characters of a commercial through unappetizing slush we had to use a banal saw cut. An acrylic bath was accurately cut by decorators and a missing half of it was replaced with glass. There is no scence to describe the way the contents of this aquarium were made. Such a design is well known to everyone who's ever faced an obstructed pipe. The results of the cut are the following: Tiret keeps a brutal fight against the problem and Artworks keeps shooting commercials of any difficulty. A virus video for Coca-Cola's communities in social networks was filmed factually "from the wheels". A creative idea of Publicis United agency has been realized in one of the rooms of Baltschug Kempinski Moscow hotel where members of the Russian national football team were staying before a game with a team from Denmark. Aleksandra Kokorina, Roman Pavluchenko and Denis Gluchakov agreed to hang their football boots on a tack and become clothes designers. During a photo shoot the creation of ideas continued. Unexpected situations were proposed to the players. A real bear was falling out of an elevator right on them, a model was throwing off her T-shirt and worn a designer's ones. In a few words well-known football players hadn't to try to imitate emotions in a frame. All their reactions were natural and simple as a ball. A creative tension was beyond the limit. The first one who gave up was electricity in the hotel the light in Baltschug went out in the most inappropriate moment. However famous footballers kept working. They are used to it as a game must be lead despite the weather and any other factors. As a result of their creative work a T-short with a unique design was made. The year has started fruitfully for Artworks. The first shooting project was a reel called "Employee" for McDonald's. It has blown up the poetic community of the country (the creative is developed by Leo Burnett agency). On web-sites and in communities of rhymesters of the Russian Federation a mass wave of imitation has been detected. The Russian poetic trend now is five or six rhymes in one line. In the studio there is also an atmosphere of rhyme and sonnet. Even an internal competition has taken place. As a result a work of Roman Kalmykov has been chosen as the best one (you can hear his voice in the commercial). Artworks Film masters a new genre, sitcoms! In continuation to an advertising campaign "Changes start with us" for a store chain OBI, ARK Group and Artworks Film have shot three more ads based on the same creative concept as the previous ones. This time other great ancient objects revived: the Petra palace, sphinx in Giza and the Trojan horse. The shootings took place in South Africa in cooperation with local production Atomik Pictures. Among unique natural landscapes of South Africa we’ve succeeded to find the best locations that were just identical to the seashore of Turkey and the Giza plateau, and also to the mountains of Jordan. Wonders of ancient architecture were skillfully added in post production and fitted perfectly into the locations that had been shot beforehand. The presenter of "About the most important" show on channel "Russia" and part-time fighter for his own health and of and all russians, Mikhail Politseymako acted as a destroyer of mold. Mikhail became a star in Cillit Bang TV commercial, developed by the Euro RSCG Agency. In two testimonial spots featured ordinary housewives, who never used Cillit Bang before. But Mikhail sufficiently tough and with his usual charm overcame not only the inertia of simple housewife but also traces of rust and mold in the masterfully created by Artworks Film decor. Commercials Great Wall and Rapa Nui that were filmed by Artworks in cooperation with Ark Sholz&Friends in April this year for a brand OBI are in short lists of the competition ADSR AWARDS in the category "Commercials". Great Wall commercial was marked twice and also is in short lists of Russian works in category TV Ads of a world festival of TV commercials Golden Hammer.